UPDATE: This episode was recored several weeks months before it was announced that Netflix is developing Narnia content. Will the movie ever get made? What’s the hold up? In this season premiere episode, Rilian, Gymfan, and Glumpuddle discuss possible reasons for the delay and their feelings on the production at this uncertain stage. Something Else: Do you have an idea for a non-Narnia topic? Post a comment below! This Fall, look for new episodes on the 7th and 17th of each month! I was homeschooled too. Since I’m taking online college courses, I technically still am. "I really enjoy the book related episodes." "I’d love to hear you guys do The Magician’s Nephew and The Last Battle. (Though I don’t think Rilian and Glumpuddle love TMN as much as I do." We’ll get there! 🙂 MN has jumped around my list over the years. It started out very high initially, then dropped down, and more recently has come back up to my top 3. I think it’s the most well-written overall in the series. At the end of the day, these are seven masterpieces, so it’s hard to rank them of course. PC is at the bottom of my list, but I still couldn’t stop gushing over it when we did our commentary episodes. I also love Spirited Away and Fantasia. I see what you’re getting at! I should probably clarify that I didn’t think you (or Rilian or anybody) hate The Magician’s Nephew. I just feel that the podcasts are the most fun when people are talking about the books about which they’re most enthusiastic. I agree that all the Narnia books are great just to varying degrees. Thanks for the shout-out, Glumpuddle! Actually next week will be my last countdown comment. But think positively! Before pre-production can even happen, other work must be done, and as you mentioned, that very well could be going on right now. Maybe in September! Patience! I’m sure a Netflix Narnia series could be great. But for selfish reasons, I’d rather they didn’t make it. I can’t afford Netflix and it would drive me crazy not being able to watch it. They better not do a Netflix Narnia. They better not. It would be almost impossible for me and my family to see it, and Narnia wouldn’t get as much publicity as it would if it were a movie, with posters and action figures and soundtrack CD’s and world premieres and all that great attention-grabbing stuff. And somehow, even with all the speculation, I don’t think it’s all that likely that they will. I feel like some of us are worrying to soon; I’m gonna wait until October to start worrying ( if we really go until then without news.) If Joe Johnston is gonna retire after the Silver Chair is done, I think he’d much rather go out with a bang than a Netflix original. Maybe I’m wrong. But maybe I’m right. Profound, huh? Narnia: a Netflix original movie – sounds pitiful. It’s the last straw: Going the way of ‘Mowgli’. It’s sad to know that Douglas Gresham gave The Silver Chair to Sony right before Sony started having major inner trouble. It looks like Sony might be bought by Disney in the next few years – or file bankruptcy. It would be great if future Narnia films helped Sony to stay afloat financially, but execs would never take that risk when its safer to be bought than invest. Also, I’m dying for this new movie to be made. But I’d rather it was never made than for it to be a sh"t film. Col. Klink, the first month of Netflix is free. Pretty sure you could sign up, watch The Silver Chair as many times as you want, and then cancel at no charge. Also the currently monthly subscription is about $11. Which is about the price of one movie theater ticket. And you’d have access not only to The Silver Chair, but all the other content on Netflix. Most Netflix shows end up on DVD eventually too. I know this is going strongly off topic but I disagree with the assessment of new “Anne With An E”. I do not recommend. Far too adult and only loosely based on the Anne of Green Gables books. Very loosely. I would completely disagree with similar treatment of any Narnia books to movies. I, unfortunately, agree with Aslan’s Roar on the Netflix "Anne with an E" adaptation. I think that as far as book adaptations go, this attempt is pretty low on the spectrum. Not only does it completely miss the tone and atmosphere of the book, but it makes significant changes to several key characters. The dark and gritty simply doesn’t work for all adaptations. That’s not to say that Netflix couldn’t pull off a good adaptation. They certainly could do a good version of the Silver Chair, and, to be completely honest, it would probably reach more people than a movie ever would. Funny how you think of a ‘Jumanji’ crossover with Narnia. Because fun fact: the guy who wrote Jumanji the book also did one of the Narnia book covers editions (the ones with Tumnuss walking in the snow and Rillian about to destroy the Silver Chair). I think what’s also going on is that Joe Johnston and Mark Gordon wanna b at the Premiere of ‘The Nutcracker and the Four Realms’ which will be coming out in theatres this November. They might talk about The Silver Chair movie while they’re at the red carpet, so let’s hope they will. They raised some really good points as to what the reasons for the delay could be. Everything from trying to secure a good budget e.g. 100 million, not having the right things in place or being stuck and wondering where to go next. I thought for them to have a script completed by David Magee meant a huge milestone has been met because without a script, no film. I was also thinking about Sony not possibly liking the script? Could that be possible? Douglas clearly likes it as reported months ago so there must be a good reason for all this. If both Joe and Mark say absolutely nothing about SC at the Nutcracker premiere then everyone should be concerned. This film does need to be made because I’m going to be in it for sure. Yay. I see your script point but I think it is the budget negotiations which is unfortunate because out of all the Narnia books, this one would probably be the cheapest to produce. Like they could make Puddleglum a totally cgi character like the Black Order but I think make up and maybe a few prosthetics would achieve a realistic look. There are the owls and Aslan and giants which would probably all have to be cgi but there’s no battle, no extremely strange setting (such as a cgi ocean) and frankly I don’t know if they would HAVE to shoot New Zealand when they’re gong to be trekking flat marshy areas most of the time. Compare that to LWW (snow, army of cgi creatures), DT (ocean), LB (lots of cgi animals and a battle), and MN (which would hopefully have a large budget because I want an amazing creation scene) and SC shouldn’t need that large of a budget. If Sherlock Season 1 can be made with 8 million, A Quiet Place with 17 million, and Jurassic Park with 63 million (not adjusted for inflation), why does Silver Chair need a 100 million? Well said! Why 100 million? Why not 99 million or less? Sadly, my own answer to that question is that the filmmakers are aiming not for 100 million, but 150-200 million, thinking it’s practically impossible to have a budget 100 million or less and make the movie look really good with movie stars (ex. Gravity 2013), which is silly, given that a movie with a budget of 150 million or more can look REALLY fake even with movie stars (ex. Tarzan 2016). Johnston said he wants to make the most cost-efficient way to tell the best possible version of The Silver Chair. Just stick to the book and make a 2 hour Film with strong characters and NO battle at the end! Honestly if they have a "too small" budget what if they totally cut marketing? I’m not saying it’s a good idea but considering that marketing can take up to 30-50% of the production costs (or at least according to the websites I can find) would it make more sense to try to market by word of mouth or social media chatter? I doubt a general audience member is going to watch a football game, see a Narnia trailer, and be like "Man I gotta see that!" even if it is the coolest trailer with amazing CGI. With stars taking to the internet (and assuming they wanted to cast a few somewhat well known talent) most of the hype and trailers could be spread for free via twitter or Instagram (just look at Tom Holland for the Spiderman sequel) and if you wanted a name talent that had like a group a of fangirls or something following them, you could probably afford less ads in exchange for the star’s free promotion? I think that The Silver Chair will be a great film with an ideal production budget of 100 million. Think of the Lord of the Rings trilogy, all of which were produced at 90-100 million dollars–they turned out great! I think it would be a real shame if the fourth movie never got made I personally like the series I have the last three movies made, I had no idea there were books for a long time but of course why not it was that way with the Harry Potter series so why not the Narnia series I have never the Harry Potter books but my mom had as I have never read the Narnia books but anyway I hope this movie does end up getting made soon as well as the other films would like to be able to see them I have the entire Harry Potter series and would like to have the entire of this series as well. Why does everything have to be romanticized? Susan/Caspian now possibly Jill/Eustace. There was no romantic link in the book and I am sick of the notion that boys and girls can’t just have a jolly good friendship. The only romantic boy/girl friendship into romance was in Horse and his Boy where Lewis states "they got so used to arguing and making up that they got married so as to go on doing it more efficiently" which is hysterical. I guess Eustace and Jill do make a good couple if that is the qualification. But the point is, they weren’t, and it is really annoying when movies just can’t leave that aspect out of even a kid’s friendship, as if the story isn’t exciting unless there’s some sort of love interest. I don’t think Gresham or Lewis would be for a LGBT etc Narnia character. It’s too radically different from the source material. No. No. No. No. No. No. Never. Jill is not a LGBTQAZDAFSDLK anything. These are children’s book man written by an atheist turned Christian theologian. Haha never. Don’t make fun of LGBTQ. Come on. You guys want to go for representation? Make Jill a female aspie! Rare, yes, but still: Kids with Aspurger’s syndrome, historically, have been bullied by peers and less cared for by teachers than the majority of functioning kids. Could explain why Jill is stubborn and doesn’t trust anyone yet seems to want friends. I agree whole heartedly. I’m somewhat sick of half baked romantic sub plots. Although they are occasionally done well, it’s usually after the characters progress as allies to friends to possible love interests. Even if they set up a solid friendship in Silver Chair with the intention of solid, healthy romance in Last Battle I still wouldn’t want it because I don’t like tween/teen romances, fictional or otherwise. "don’t make fun of LGBTQ. Come on." Yes call it what we do in Australia, Perversion.It has no place in any movie, let alone a children’s book. And in case you want to attack me, my best mate, a kliensfelter says exactly the same thing. Absolutely No! That’s one of the things I don’t want to see in this movie. I’m hoping that they don’t do that! If they can’t add a Jill and Eustace romance In SC, they’ll probably add it in LB, if it ever gets made. What do you guys think of a Narnia musical? As for non-Narnia related topics: What is your most possession? On the topic of the release date I think Jumanji 2 might actually get bumped to a later date as Dwayne Johnson stars in (the Disney produced) Jungle Cruise movie about a month earlier I think, which would maybe make a nice opening for SC? Also would you ever consider a livestream as a Q&A type thing? It’s too soon to say, but if The Silver Chair keeps getting delayed, I find myself wondering if we won’t just end up seeing a reboot of the whole series — especially given how much Hollywood likes reboots and remakes. In the spring of last year, TriStar’s president Hannah Minghella said that she didn’t think that the world was asking for a remake of LWW at this point in time… but as the radio silence continues and the years go by, I wonder if a LWW remake wouldn’t have an easier time getting greenlit. Or even MN, starting the series over in chronological order. I would be surprised if the Lewis Estate would be interested in doing that after investing so much time and money into getting SC made next, though — unless they thought rebooting the whole series was the only way to eventually get their vision for SC out of development hell! You raise a really interesting question about LWW. At what point would a remake of LWW seem like a safer bet than doing one of the unmade books? I think if SC production completely fizzles out in the next few years (Joe Johnston let go, Magee script starts collecting dust)… They’ll probably start trying to develop The Magician’s Nephew. It’s a much more popular book than SC, and has the prequel connection to LWW. If they are thinking soft reboot, MN makes a lot more sense than SC. I’ve been wonder about that too. I’d still like to see Silver Chair get made. But if I’m being honest, the idea of starting the whole series over again from the beginning really intrigues me. A fresh start often sounds appealing. But when something is rebooted, they usually go out of there way to make the new version as distinct as possible from the original. Which makes sense. I don’t think LWW was great,, but it wasn’t fundamentally way off either. If a new version had a priority of being as distinct as possible from the Walden LWW… I’d be concerned. Very likely, for example, it would be set in present day. Maybe even in the United States. Frodo, if the studio that created Secret of Kells, Song of the Sea, and The Breadwinner got the rights to Narnia… I would die of excitement. I’ve never really been a fan of the idea of animated Narnia films. Though I’ll readily admit that has more to do with my own personal preference them anything else. In general I prefer live action over animation. And with Narnia half the fun of seeing a film adaptations is, at least for me, seeing the story come to life and become real in a way you can’t really do with animation. But with that said, if someone did make an animated and it was a great film and a faithful adaptation, I wouldn’t complain. Another possible reason for delay could be the availability of actors, locations, or other personnel that they really have their heart set on. I don’t think Millie Bobby Brown is the right age anymore, but suppose they had their hearts set on a star cast and just can’t get them all together? I’m still optimistic SC will be made, but I do think it isn’t likely to begin filming for quite some time still; possibly not til late next year as that’s the best season for filming in NZ. I agree. Millie is now too old and is trolled a lot online. Also if they can’t make it well I’d rather they didn’t do it at all.. #follow the book. Thanks so much for the podcast featuring your opinions on the upcoming Silver Chair film! I was really excited for its release, which was followed by worry that it wouldn’t come out at all due to all the silence from everyone involved in the production. Your podcast gave me a new take on the whole thing, however, and I’m feeling a bit more optimistic now, thank you! Ooh, will you please talk about LotR or Tolkien as a random subject at the end of a podcast?? I like the new Something Else segment. It’s interesting to hear more about you guys. I’m still hoping for Silver Chair to get made, though my conference in that actually happening with this group of filmmakers is at it’s lowest point. And about the ‘humor ‘ thing, I think it’s worth noting that Douglas Gresham is the one who mentioned it, so take from that what you will. 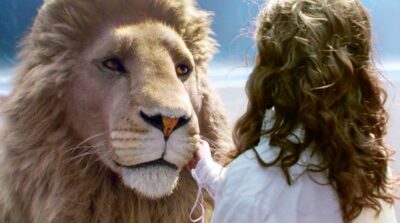 The mass-marketing problem with "Silver Chair" is that it’s NOT Aslan’s or LWW’s Narnia. There are no touchstones to appease the LWW-only punters. No sparkling snowy forests, no Mr Tumnus, no glorious green meadows, no Pevensies. It’s the only Narnia book where Aslan does NOT actually appear IN Narnia. It’s a grey, chilly, soggy. lonely, "November" sort of adventure — and that’s BEFORE the action moves underground! If I were Gresham, I’d stand firm on fidelity to the book, but scale back on big-screen ambition. Go Netflix, Mr Gresham! Or BBC: take it to the "Dr Who" people! I think Jack would approve. I would not be opposed to Jill having Aspergers. I’d also be open to her having a mental disability. They too are underrepresented in films. Perhaps Schizophrenia or Bipolar, that would make sense for Jill. But I don’t want them to make a big deal about it and focus more on her disability then the story or her character. I actually have Asperger’s syndrome. But I’m not a fan of making Jill have that condition. It really wouldn’t add anything except having her say "I have Asperger’s" and possibly having to explain what that means. On 2nd thought, I now feel that Eustace is the more likely candidate for aspergers – Douglas Gresham told Glumpuddle that Eustace, before his “un-dragoning”, was the epitome of his schizophrenic brother. At the beginning of VotDT he has no friends and is ok with that. By the end, he genuinely wants to share friendships, despite his awkwardness and blunt socializing. He’s a good kid, by the end. I only mentioned aspurgers because I was diagnosed as a child – though maybe that has changed. If – God forbid – I were directing The Silver Chair, that would be my way into Jill’s character: She’s not a special kid – just dealing with normal woes in a more intense way than most kids. And she’s alone. At least, she feels alone. Glumpuddle talked about relating to Jill because he’s had difficulty trusting people after being hurt by them. That’s good to know, but I feel you need a personal reason for that lack of trust. Is Glumpuddle an aspie. I don’t think so. Just home schooled. 😀 Forgive me. Oh dear, did I start this? Sorry! But I do think that Jill should have something about her that might make her a bully target, and YES, don’t play up specifics, because specifics are not the point! But a (subtle) choice should be made about ‘who’ Jill is, and it should play into the depression that seems to trouble Jill through the whole story. And yes of course, Aslan is the Light. I am also a fan of her look in the original illustrations, so I may be bias. I hear a lot of Narniawebbers saying things like "The Silver Chair is gonna get pushed to Netflix." or "It’s been buried and forgotten about." or "It’s never gonna get made!" I just want to point out that (1) We’re only late for news based on when Joe Johnston HOPED to start prepping. That was never official. Nothing’s really ‘overdue.’ No promises have been broken. In the business world, things don’t always go exactly as planned. And we’re only a month or two "late". Now is not the time to tear our hair. (2). Things have to be done before pre-production can begin. From what Glumpuddle mentioned about Joe Johnston hiring an art director, it sounds like things probably are going on right now. We still have several months to go before December, when Joe Johnston HOPED to start filming. To sum it all up, I’m not worrying, and neither should you. People who say that the Silver Chair will get shelved or Netflixed may very well turn out to be right in the end, but right now, there’s no reason to think so. It’s my firm belief that Aslan, Douglas Gresham, and Joe Johnston are "on the move". Just have patience. Think like a badger. Wait until October to start worrying. BTW I would LOVE to see another BBC Narnia!! Can you imagine modern film technology combined with their trademark faithfulness to the books they adapt?! That could be the best Narnia version yet! Your Twitter said the site was down???? Did you just now fix it? Yep, it was down for a few hours. During that time, I resolved to live like a NarniaWebber even if there wasn’t any NarniaWeb. Seriously, it’s September and this is ridiculous. No word at all in the first 8 months of 2018. Seriously, Sony. Stop your boardroom brawls and Get your act together! It’s just a movie – and one likely to make money regardless of the budget. On a nostalgic note, I remember way back in 2010 when ‘Voyage’ was released (and I was still a kid), 17-year-old Will Poulter was expected play Eustace again in The Silver Chair. You know who I thought would make a terrific Jill Pole? 16-year-old Irish lass, Saoirse Ronan. Aw, those were the days. 30 days until ——— just kidding. Apologies to all who get annoyed by countdown posts. Seriously, it’s September. We’ve heard nada in the first 8 months of 2018. No news on the Narnia movie. Seriously, Sony: You wanted to do this movie. Stop your petty boardroom brawling and Get Your Act Together! It’s just a movie with a budget like any other, and one that will likely make money. Douglas Gresham gets final say on the script. What’s the big hoopla? On a nostalgic note: Way back in 2010, 17-year-old Will Poulter was expected to reprise his role as Eustace Scrubb in The Silver Chair. You know which actress I thought would make a terrific Jill Pole? 16-year-old Irish lass, Saoirse Ronan. JFGII, you don’t have to post both drafts of your post online. Just trying to be helpful. P.S. I agree on one thing: A 16-year-old Saoirse Ronan as JILL POLE??? 🙂 😀 That would have been cool. P.S. : why the sudden comment silence? Oops, that’s "don’t know when". Thanks Glumpuddle for fixing the comments! HAPPY 65TH BIRTHDAY "SILVER CHAIR"! Hey what’s with the comments? Re NZ and ‘just marsh’ no, you are forgetting the giant castle of Harfang in the mountains high up near the western wastes, the snow and falling into the writing. All perfect for NZ. Just checking to see if the comments are working. I really hope that production actually starts later this year. I’ve enjoyed the previous 3 Narnia movies, and if all goes well with this movie, we can finally have all 7 movies adapted! Besides, the other Narnia movies got generally good reception, so I have good faith that this one will too. I personally won’t have any problem if this turns out to be a big budget movie, as long as it’s done tastefully. I don’t want this movie to end up being one of those things they announce and leave it hanging like "The Adventures of Thomas" (a movie about Thomas the Tank Engine in WW2). Anyway, this was an enjoyable podcast as always, and I look forward to catching up! Cheers! Hey, folks! Great to hear you all doing podcasts again. I missed you all! And it was a terrific discussion as always. One thing that didn’t get mentioned, but which I think is important, is "Nutcracker and the Four Realms." When Disney lost the director for that movie, they called in Joe Johntson as an emergency replacement. I expect that it’s taken up a lot of Johntson’s time. That film is scheduled to be released in November, at which point Johntson may rest up for the holidays before working on anything else. If we start to hear rumblings early next year about production on "Silver Chair" moving forward, then everything is probably fine, and "Nutcracker" was the only reason for delay. If we continue to hear nothing after a few months into next year, then I’ll suspect that the problems run deeper.